Our family loves anything and everything French. My love for French things started when I was a child. My mother was a French teacher and I took my first trip overseas with her when I was sixteen to France. My husband and I met in French classes in high school and went to Paris on our honeymoon. We are looking forward to the day when we can take our kids there and show them the town. My daughter will buy anything with the Eiffel Tower on it too. 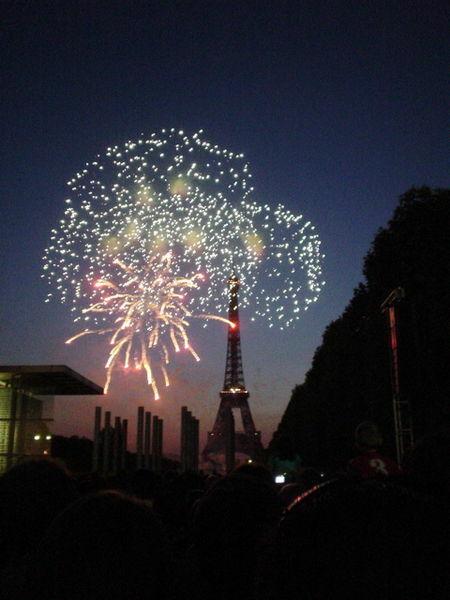 So at our house, we celebrate Bastille Day on July 14th. It is a national holiday in France where they celebrate the storming of the Bastille, which was a prison, and the start of modern day French government. To celebrate Bastille Day, we will be having a French meal: ham and cheese crepes for dinner and Nutella and banana crepes for dessert. My daughter and I were also inspired to make some Eiffel Tower cookies by the decorated cookie. She has a great tutorial on her cookies and walks you through how to make them. The only tweaks we made were substituting royal icing for the fondant and then using corn syrup and colored sprinkles for the fireworks. Here are my recipes for the crepes. These are great for a quick dinner, though the cook usually ends up eating while cooking. Enjoy! Combine all above in a bowl and mix well with an electric mixer until well mixed. (Don’t try to use a whisk or spoon. I learned the hard way that doesn’t work.) Lightly coat your nonstick skillet with nonstick cooking spray. If you get too much, use a paper towel and wipe some off. Remove from heat. Depending on the size of your skillet, pour enough batter into the pan and lift/tilt it so the batter evenly but thinly coats the bottom of the pan. For instance, I have a 10″ skillet that I use and I usually put about a 1/4 cup of batter in. Return to heat. Add swiss cheese first, then ham on top of that. Let cook until bottom side has light brown spots on it and the edges are dry. Fold the sides over like a burrito, slide onto a plate, and serve warm. For the Nutella banana crepes, I use the same batter. I spoon some Nutella up the middle and then slice a banana over the crepe in the pan. Cook same as above and slide onto a plate when ready. We have also experimented with peanut butter and chocolate, banana blueberry, strawberry chocolate, and blueberry chocolate. ← Saltation Gives You That Epic Feeling: Will Dust Storms Return? 2 Responses to Happy Bastille Day! woo hoo, thanks for mentioning me! Or rather, moi! You’re welcome!! We love your blog at our house! Made crepes for lunch just now and we were out of bananas soooo we went with semisweet chocolate chips, dried cherries, and a sprinkle of almonds. Incroyable! !